THIS IS IT! 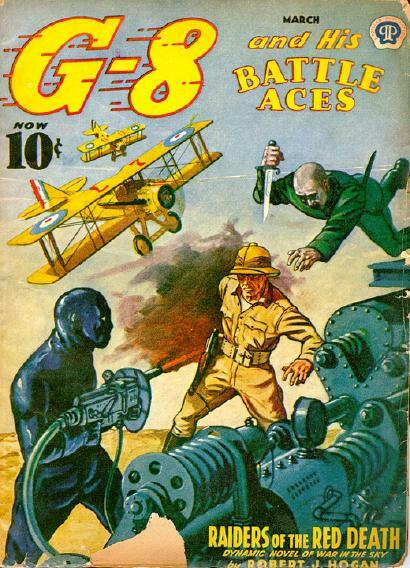 G-8’s FINAL BATTLE WITH DOKTOR KRUEGER! 103. 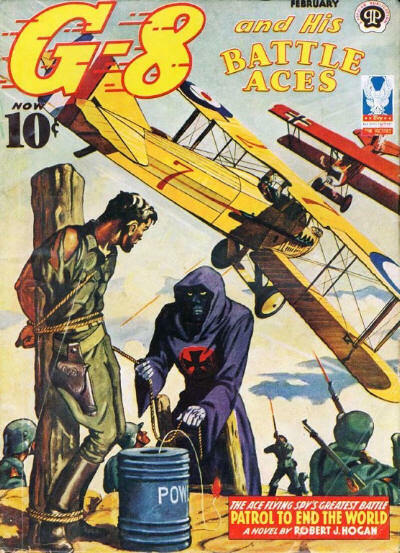 WINGS OF THE HAWKS OF DEATH (April 1943) – G-8 and Nippy Weston get court-martialed in this tale! 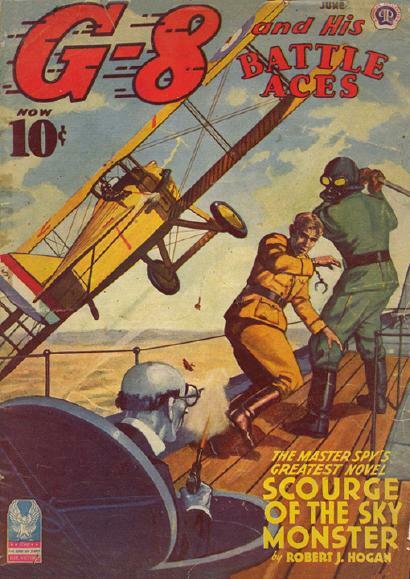 The two are framed for stealing and gambling away a small fortune in Allied war funds. Found guilty, the two make a dramatic escape from the courtroom and add assaulting a General Officer to the list of charges while doing so. With the pair on the run a puzzled Bull Martin and G-8’s British manservant Battle do what they can to help G-8 and Nippy try to unravel the masterful deception. The threads eventually lead them to their newest foe – Baron Von Heidt: the German Empire’s greatest sportsman. 100. 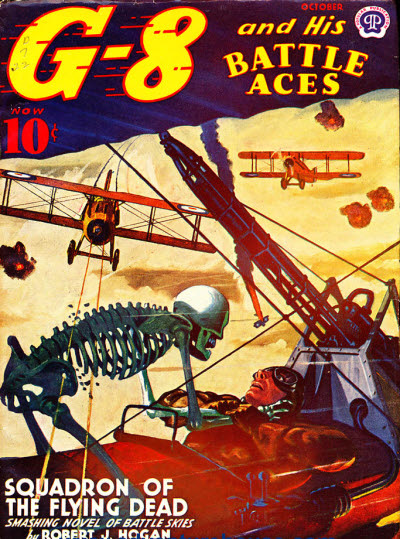 WINGS OF THE GRAY PHANTOM (October 1942) – Yes, it’s the 100th issue of the G-8 Pulp magazine! An old foe – Mr Matsu – returns for the occassion. As a quick reminder to people unfamiliar with World War One during THAT war Japan was on the side of the Allied Powers, not the Central Powers. The Japanese Mr Matsu is a traitor who took his scientific inventions to the Central Powers because they offered him more money than his native Japan did. This time around Matsu’s come up with a way of making fighter planes virtually invisible. Featuring the return of Doktor Krueger! 97. 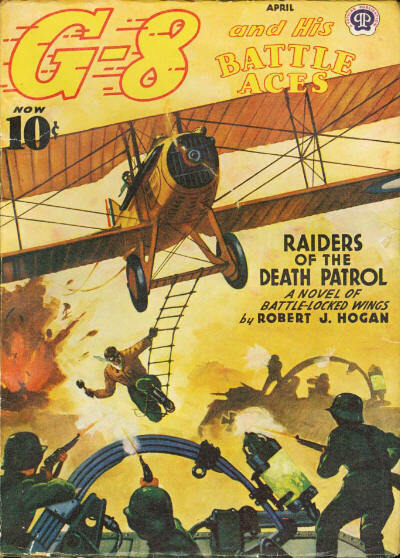 RAIDERS OF THE DEATH PATROL (April 1942) – This story features the return of G-8’s old foe Herr Butscher! The crazed genius who was thrown out of medical school so long ago has been busy since his last appearance devising a deadly green liquid that destroys the metal of tanks as easily as it destroys human flesh! 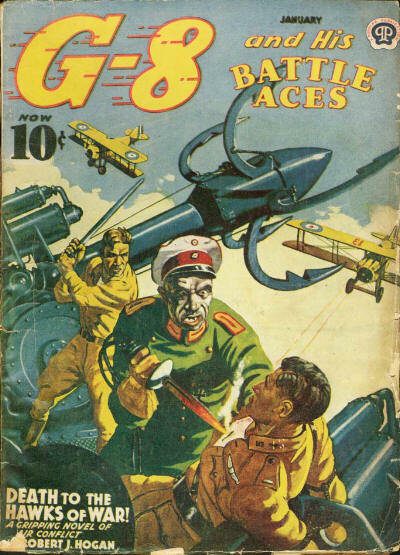 Herr Butscher’s Death Patrol are deployed along the Western Front, armed with modern-day catapults that hurl glass containers filled with the green liquid. As the containers are catapulted into the Allied lines the soldiers and armored weapons are devastated, threatening to change the entire course of the war. 94. 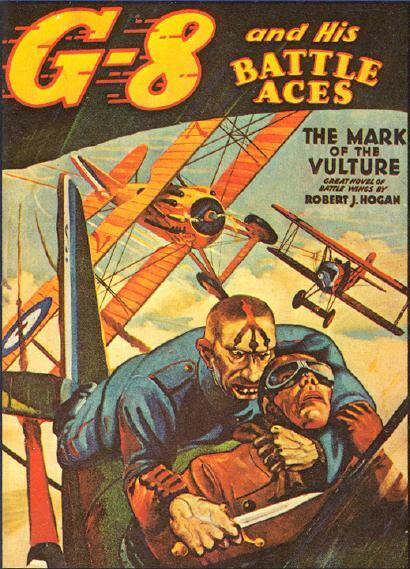 SQUADRON OF THE FLYING DEAD (October 1941) – It’s been awhile since our heroes have tussled with zombies of any sort so fans of undead adversaries will love this story! 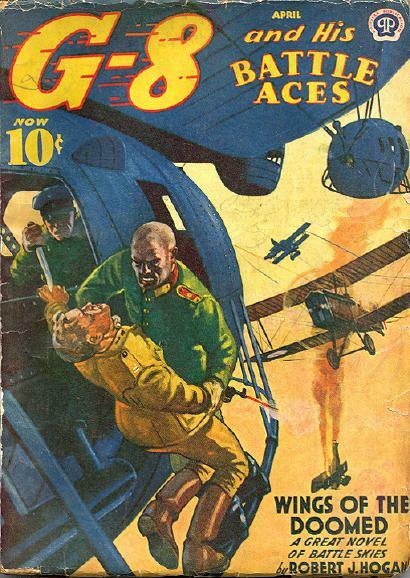 G-8 and his Battle Aces find themselves in India and Afghanistan this time around, where another native-born menace has joined forces with the Central Powers to try to drive the hated British Empire out for good. 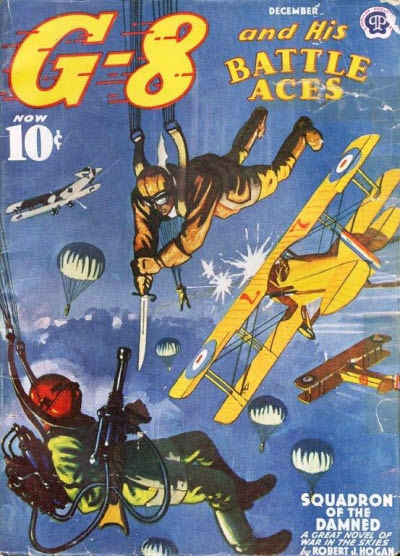 G-8 faces his greatest threat – three boring covers in a row! 91. 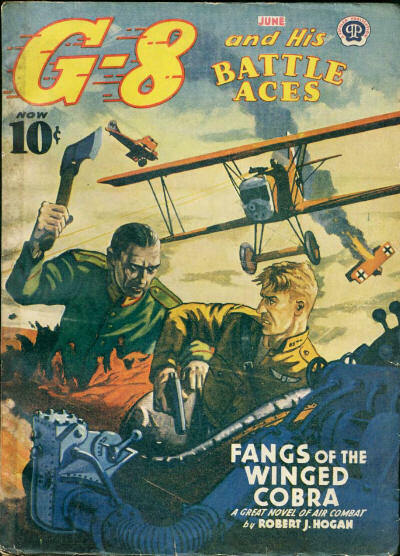 WINGS OF THE DOOMED (April 1941) – Introducing an all-new villain for G-8 and his Battle Aces to take on. That villain – Baron Von Tollheit. Ask not for whom Von Tollheit tolls, he tolls for THEE, dude. The Baron has invented a device which generates waves that at first painfully induce deafness and, as the victim continues to be saturated in exposure to them, cause total madness. Baron Von Tollheit has designed these devices so they can be fitted to aircraft and he sends them into the skies to drive all Allied planes from the air. 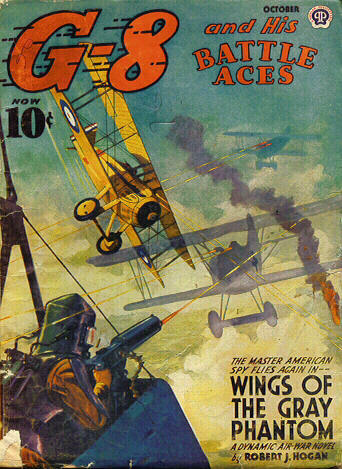 Total air supremacy for the Central Powers will be just the start, however, as Von Tollheit’s invention will next be used to reduce all Allied ground troops to drooling idiots with mush for brains. 88. 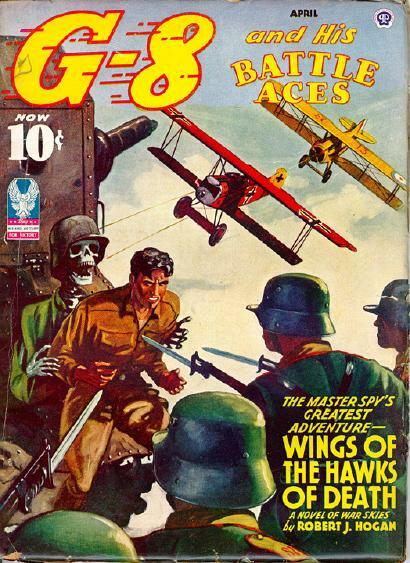 DEATH TO THE HAWKS OF WAR (January 1941) – The very first appearance of Herr Teufel (“Mr Devil”), the latest member of G-8’s Rogue’s Gallery of foes. Herr Teufel is tall, thin, pale and boney-faced. Like so many of our hero’s adversaries he’s a mad scientist and in his particular case his headquarters is a hidden lair in the Bavarian Alps. 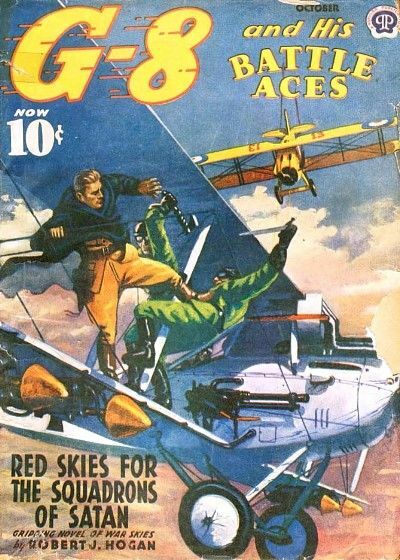 Herr Teufel’s plan to help the Central Powers win the war involves his latest invention – a drug that, when injected in German pilots, transforms them into maniacal, blood-thirsty sky warriors. These “Hawks of War” have supernatually-fast reflexes, enhanced vision, unerring aim, machine-like stamina and lack any need for sleep.